Every year Gensler designs millions of square-feet of workplace environments. 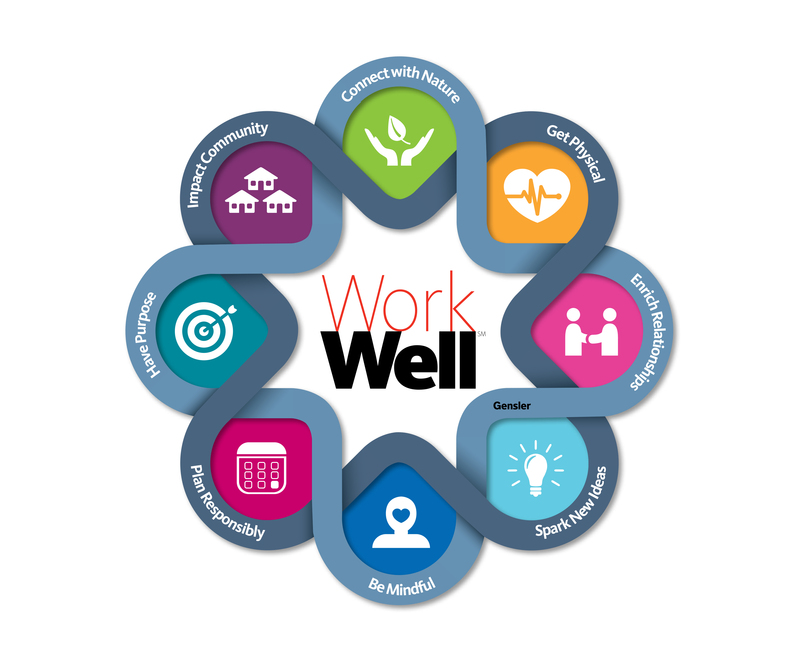 We have an obligation to understand the relationship between the environments and spaces we produce and the meaning they have for others, which is why we developed a holistic wellbeing model, WorkWell℠. In the past, organizations measured employee satisfaction. Today, the top firms measure things like happiness, which only a few years ago might have been considered too touchy-feely. For the last six years, Etsy has been using its Happiness Index as a critical tool to measure the experiences and sentiment of their employees. They believe that a happy employee is someone who feels excited by their work, proud of the company’s decisions, connected to the mission, aligned with their values and supported by their colleagues. Through their annual study, they gain a broad view of the health of their organization, as well as insight into how employees relate to Etsy’s mission and values, and to one other. At Gensler, we also believe you should be both healthy and happy in your work environment. We learned from our 2016 U.S. Workplace Survey results that companies with healthy and happy employees are twice as innovative. Creating a functional work environment that allows employees to do their job is table stakes. To attract, retain and inspire the best performance from top talent, you need to invest in engaging and energizing your employees—as well as helping them sustain productive and happy employment. By investing in your environment and creating programs that support the wellbeing of your people, you can lay the groundwork for more productivity, greater innovation and a competitive edge. People are more interested in putting best practices in place than obtaining certification. They are also more interested in a system that allows for continuous improvement rather than recertification. Providing our clients with the tools and know-how to help them be better starts with trusting that they actually want to be; and also trusting that they will do the right thing, so there’s no need to follow them around with a checklist. Motivation is not fully understood and therefore questioned. According to the >Global Wellness Institute, only 25 percent of employees believe that their company offers a wellness program because they care about workers’ health and wellbeing. Fifty eight percent believe their program exists only to cut company health costs, while another 17 percent believe their program is in place to make employees work harder and be more productive. In other words, three out of four employees perceive their companies’ wellness programs as being about the bottom line rather than employee health. Emphasize the employee, not just the environment. Today’s workplace wellness systems are primarily focused on spatial requirements such as optimal lighting and efficient mechanical systems. Although the spatial aspects are extremely important, they’re only half of the equation. So, what’s missing? A greater emphasis on the employee. Workplaces that encourage increased physical activity, better nutrition, medical self-care and ergonomics improve the health of their employees. Views to nature heal, soothe, restore and energize while reducing stress and preparing us for new tasks. Companies that develop programs and design spaces to connect people to the larger workplace community help their employees thrive both personally and professionally, resulting in improved business performance. By creating inclusive, collaborative and diverse environments, organizations can harness human potential by sparking new thinking. Respite from mental and visual busyness results in more creative and focused employees. Mindful strategies result in the enhancement of resilience, emotional intelligence, empathy, creativity and mental focus. Companies that help their employees manage their health, finances, and resources have employees that are better prepared, less stressed and more productive. A keen sense of purpose isn’t just good for morale, it’s good for business. Whether used as a strategic differentiator, or an organic attractor for customers, purpose rallies the troops behind a shared goal, gives meaning to exercise, and shapes individual approaches to different jobs. Companies that make social impact integral to their operations are rewarded by solidifying bonds between employees and having a greater connection to their communities. Our founder, Art Gensler said, “A happy and healthy workplace is the foundation for a successful business.” Every day we are inspired to improve the organizational and individual wellbeing of our clients so that their employees are their best selves every day. Interested in these ideas? Read more in the full text of our document Working Wellbeing. This post is the third in a series by Gensler’s Consulting practice in Washington, D.C. Read the first two documents, The Engaged Employee and Change by Design.